The transition from being a child to becoming an adult can be challenging no matter who or where you are. But kids who grow up at an orphanage have the additional challenge of not having a home or family support system once they age out of the children's home. At age 18 they can no longer stay. 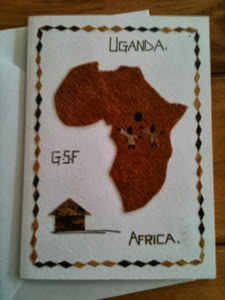 The missionaries at GSF along with some others in Jinja have been working to help these kids with that transition, preparing them to become independent and find a means to provide for themselves. The students who have done well in school can earn scholarships to go on to University. Recently the GSF team also connected with a ministry called Investment Year in which students are given four different internships throughout the year along with intentional discipleship. The missionaries here are hopeful that this investment year will help ease the transition for some of these kids. If you are interested in providing financial support for a scholarship for one of these kids to help continue their education, go to goodshepherdsfold.org for more information. We have met several of these former GSF kids in Jinja. Some of them also come back to campus to work on their school breaks. These students often take jobs working on the farm or for the maintenance department in order to earn money for their school fees or books. Here is a little information about some of the young adults we have recently gotten to know. Paul grew up at GSF, and now he leads worship at the church we attend. It is so great to hear him worship the Lord and help many others to do the same. Many of you have also seen the blog post with the video interview with Solomon who is now at the University. (If not you can go back and find it in April or May of 2012.) Diana is a young woman who is now working at GSF as a house mom caring for the toddlers here. Jonah, works at a leather shop, but also makes cards and other artwork. Here is a photo of a card he made for us. Hopefully some of you have received one of these. Not many students think of working on Chemistry as a great way to spend their Saturdays, but Fred is diligent and is working hard to do well in school. 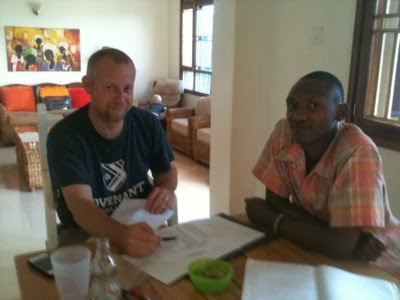 While we are here primarily to help by teaching the missionary kids, we are very thankful that David has been able to work with Fred and help him with his Chemistry. It is encouraging to see the way that God is continuing to provide for these young adults as they transition toward independence from the care of GSF. But we are all always dependent upon The Lord. What do we have that we have not been given? (I Cor. 4:10) Our greatest prayer for these kids is not just that they would find successful jobs, but that they also would walk with the Lord, knowing the joy of living as His children and be a part of building His kingdom here in Uganda. Please take a moment and pray for these young adults.